Tesla’s key asset is Elon Musk’s credibility, as Ed Niedermeyer noted on Bloomberg West Tuesday, and that asset has taken a beating recently. The crashes of Tesla cars on autopilot and Tesla’s lowered guidance share a disconnect: Neither Tesla’s technology nor its operations have lived up to Musk’s hype. The recent spate of negative news may have also impacted Tesla’s hedging costs, which have risen. We elaborate and discuss why investors should consider this indicator. That quote from Goldman Sachs’s business principles came to mind while watching the discussion of Tesla (NASDAQ:TSLA) on Tuesday’s edition of Bloomberg West. Before getting to that I should note that the guest host of the show on Tuesday was Bloomberg Technology Editor Cory Johnson, who has been a longtime skeptic of Tesla. 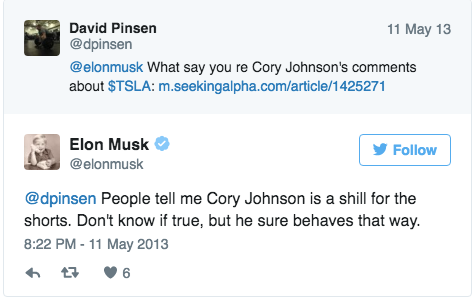 Musk, in turn, doesn’t seem to be a fan of Johnson, judging by Musk’s response to this tweet of mine a few years back. That said, the most damning criticism of Musk and Tesla came not from Johnson, but from his guests, Bloomberg View columnist Ed Niedermeyer, and Bloomberg Gadfly columnist Liam Denning. I’ve transcribed the most pertinent parts of their discussion below. It begins with Niedermeyer responding to a question about the crashes, including the fatal one, suffered by Tesla enthusiast Joshua Brown, and the one newly disclosed by the Detroit Free Press. Cory Johnson pointed out that Brown had posted videos of his Tesla while it ran on autopilot, and that Musk had even linked to one of those videos in the past.